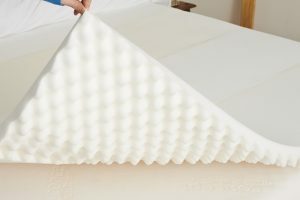 Foam mattress toppers can be used for any type of mattress to improve comfort levels. They come in various different sizes and therefore can be used with almost any mattress. It can act as an upgrade to an existing mattress that might be too firm now. Since they are made from the same viscoelastic material as a memory foam mattress, they can offer all the benefits of using a memory foam mattress. They are relatively easy to move around and can be taken on holidays or trips to ensure a proper comfortable sleeping surface. They also come in various combinations of thickness and density, giving the same level of control when choosing a foam Canada mattress. In terms of cost, a topper is cheaper than buying a memory foam mattress. Please note that foam mattress toppers will not be able to compensate for the deficiencies of poor quality or old worn out mattresses. In those cases, replace the existing mattress with a memory mattress.